Last time I went to Portugal, it was a typical sun and sea holiday, on the Algarve coast. In 2015, the cultural prospects were far better. In an echo of our trip to the Sherry Triangle in Spain several years ago, my girlfriend and I decided to wander through the wine lodges of Porto drinking the eponymous fortified wine the city is known for, along with a well regarded museum or two. From the airport, take line E on the Metro (there are about five lines): it took us about thirty minutes to get to Bolhão, paying around €4. The only downside to Porto was the merciless rain beating down for much of the week, for roughly half our Portuguese experience. After we flew in from Bristol (easyjet have just opened up a new route, around £65 when we booked), we headed to the Metro directly from the airport. Once we had dropped of our bags at the hostel, that gave us the scope to do some (rather wet) exploring. I picked up some shoes myself, from Sport Zone in the Via Caterina mall, as I've been on the look-out to replace my well-used Scramble Mint shoes (the grip has almost gone, making it risky to walk anywhere muddy or in wet weather). I'm still breaking in the Berg Archerfish, but hopefully they will be up to the job. In the mall we also got our first taste of what is apparently a famous Porto dish, the francescinha. It means 'little French thing' and is essentially a croque monsieur that's been down the gym and pumped a lot of weights. Beef, spicy sausage, loads of cheese, two big chunks of bread and all doused in a hot beer sauce: it's a great way to fuel up for all the walking you'll be doing in Porto. On Saturday, we set off across the river to check out the port lodges, the first of multiple port-based excursions. There are a lot to choose from, mostly clustered around the bottom of the bridge, but a number are also set further back from the river. Before you go to the lodges, it is worth checking out the Museu do Vinho de Porto (Port Wine Museum), free on Sundays from 10:00-14:00. There is lots of information, filled with comfortable armchairs, very welcome as we were hiding from the rain. I wouldn't have paid to go in, as it's not especially impressive, but a pleasant way to brush up on your port knowledge if you arrive near a Sunday. We decided on Graham's to start our port lodge tour, a hefty walk away but well worth it. Probably due to the necessity of a long walk, it wasn't super busy, though the restaurant at the front was doing a good trade. Note that the first entrance you come to is for that restaurant. It extends a long way: if you are looking to go on a tour, walk all the way around the building. That takes you into a large reception area. They'll send you to watch a short film first (which we missed, but it's all repeated on the tour anyway), then take you down into the cellars (somewhat confusingly, that's caves in Portuguese). Graham's isn't the oldest of the port companies, starting off in 1820, but it is still in family hands rather than shareholders, albeit not the Graham family. Instead, it was bought by the Symingtons, who first began working for the company in 1882. Interestingly, they still have barrels of port from that year. So far, they've opened one, which they sell in E5,500 bottles. A single barrel does over 600 bottles, with two barrels left. The tour only had six people on it, so chatting with the tour guide was a relaxed affair. Either way, we had two inquisitive Germans in the group: my mother's people can generally be relied upon to put forward some incisive questions. These two asked pretty much everything we wanted to know, handily. That was followed by the climax of the tour, the tasting. 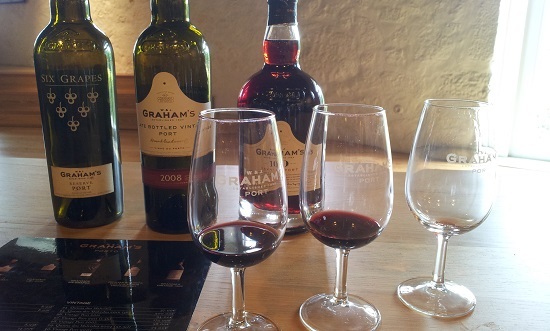 At Graham's, the cheapest option is the €8 'classic' tasting, which gets you three generous glasses of port. From what I understood, there are several varieties of port, varying depending on the year and how it is kept after being picked and crushed. A 'vintage' is from a single harvest, put straight into the barrel after the authorities declare that year a vintage (which only happens a few times a decade). It can then age for a long time: the 1882 barrel was opened 130 years later, for example. A 'ruby' goes into the bottle sooner from large barrels, getting a glorious red colour and fruity taste. The 'tawny' is from smaller barrels and takes on more of the woody colour, but still sweet. Then there is the misleadingly named 'Late Bottled Vintage' (LBV). This is actually a non-vintage year, left in the barrel longer so that it can mature before being bottled, hence the 'late' part. Sandemans is the most commercial of the port producers we visited. Its memorable logo and prominent position on the riverfront attracted the largest tour group, with well over fifty people crammed in around me as we wandered through the cellars. It was cheaper than Graham's at €6, but you only get two glasses of port to taste. The famous logo was created in 1928, a silhouette of a Zorro-esque figure in a hat and cape. The cape sadly does not come from Zorro, but rather the graduation attire of Portuguese students. Those students were a very visible group during our trip, because we arrived right when they were all completing their studies (they celebrate with a massive parade). The logo's hat relates to sherry, apparently, another Sandemans product. Like several of the other port companies, it was founded by a Scot, but is now owned by some large conglomerate. My favourite port lodge was Ramos Pinto. Set up by Adriano Pinto, who wanted to make it super extravagant, but couldn't get permission. He therefore painted the building yellow to stand out. They are known for their marketing, but sadly no pictures are allowed: a guard walks behind you to check. There was a special port created for for the church, bizarrely, with a cardinals hat. Some of the aforementioned posters were decidedly saucy, especially Leopold Metlicovitz's 1908 'temptation' design, so I'm not sure how Pinto managed to get that past the presumably strict censors (given Portugal was a very Catholic country). There was also some androgyny, again perhaps a little surprising for 1926 (according to the footnote in the book, that's when René Vincent created it, though I've seen other sources say 1940). The tour itself was not all that impressive, particularly compared to Graham's, but the content was magnificent as well as unique among the four lodges we visited. Rather than just lots of barrels and bottles, you get a museum full of interesting commercial art. The late 19th and early 20th Century posters are worthy of inclusion in a gallery. I would have liked to learn more about them, but unfortunately the book sold in the gift shop is in Portuguese only. Nevertheless, I could work out footnotes and references to the paintings I wanted to investigate, a useful starting point. I enjoyed Joana Carvalho's 2013 riposte to the rather sexist temptation poster, flipping the genders: I'm assured this was indeed used as part of a marketing campaign. Although we didn't do the tour, we did have a great meal at Taylor's. 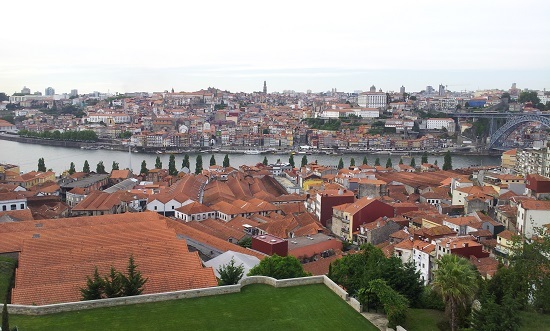 There's a fantastic view of Porto from the window, along with excellent food. Taylor's also have a connection to the five star hotel nearby. I've got no intention of splashing out on five star accommodation, but you can still enjoy the luxurious hotel bar. There's an even better view here, on the terrace. I got myself an affordable hot chocolate, which came with all sorts of small snacks (I especially like the wasabi). We finished off Saturday at Igres de Sao Francisco, a now deconsecrated monastery and church. There are lots of bones there in a weird crypt thing that looks vaguely '60s, but is from the 19th Century. Creepily, you can look at the bones below you via a transparent sheet that forms the floor. The Palazzo Bolsa is worth a look too. There are a number of beautiful murals, late 19th/early 20th, fitting with the medievalism that was broadly popular at the time (best exemplified in the UK by the Pre Raphaelite Brotherhood). The highlight of the trip for me, as usual, was an art gallery (free on Sunday mornings). As I've said repeatedly over the years, my taste in art is largely limited to 1450-1750, making an exception for the Pre-Raphaelites. I may finally have to expand that, as I've increasingly realised how much I like art deco and art noveau. The examples of 19th Century Portuguese art were also appealing. That was very much the focus of the museum: though it advertises itself as having art from several centuries, it's a tiny selection. In the three or so hours we were there, I only saw three paintings that were pre-19th Century. Henrique Pousão was probably my favourite. Augusto Roquemont, the son of a German prince, was appealing too, as was Aurelia de Souza. Unfortunately the information on the artists was limited, unless you happen to read Portuguese. The information captioning the paintings was sparse too, just the name of the painter and occasionally the date. Still, given it is free to enter, that's to be expected. If you take it slow, you can spend a pleasant two and a half hours here looking through the collection, which includes some fine sculpture too. Hopefully in the future they might bring in some books in English.